Wife selling in England was a way of ending an unsatisfactory marriage by 'mutual' and 'not so mutual' agreement began in the late 17th century, when divorce was a practical impossibility for all but the very wealthiest. At todays prices the equivalent cost of obtaining a divorce in those days would be £20,000.00. 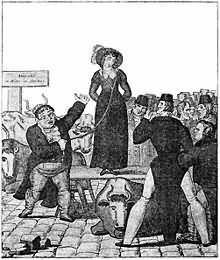 After parading his wife at a public market place with a halter around her neck, arm, or waist, the husband would publicly auction her to the highest bidder, often using the services of an auctioneer. Wife selling persisted in England in some form until the early 20th century; according to the jurist and historian James Bryce, writing in 1901, wife sales were still occasionally taking place during his time. In one of the last reported instances of a wife sale in England, a woman giving evidence in a Leeds (city in West Yorkshire) police court in 1913 claimed that she had been sold to one of her husband's workmates for £1. The widespread belief that a man could legally divorce his wife by putting a halter around her neck and leading her to be sold in the marketplace on a fair day. In some cases this was a relatively civilized arrangement between the husband, wife and her lover, all three meeting amicably afterwards for a drink. In other cases the wife would be ‘sold’ to a total stranger for the highest bid.. The practice of 'wife selling' was not strictly legal but became popular among the poor as a remedy to a bad marriage. In the early days the legal authorities turned a blind eye. The practice became more unpopular in its latter stages and was increasingly stamped down on by the the courts and could involve upto 6 months in prison. the minimum price expected was 25 pence. By this time the wife selling practice was no longer considered respectable by the townspeople. For three nights running the purchaser and his new ‘bride’ were subjected to ‘rough music’, a traditional rural punishment for sexual misdemeanors where the victims would be assailed by a cacophony of discordant noise and ribald verses. On the third night a straw effigy of the man was burnt outside his house. He eventually gave in and paid the original husband to take his wife back. In 1760 Gloucestershire magistrates heard the case of a woman who had married in the 1740s. She and her husband did not take long to part by means of a wife sale in Gloucester. Her new husband was a coal miner, Nicholas Read, who took her to Bath, where they were married "by one parson Crey, a lawless minister there." By the 1790s, the practice had become so widespread that it was the subject of editorial comment. "As instances of the sale of wives have of late frequently occured among the lower classes of people who consider such sales lawful, we think it right to inform that, by determination of the courts of law, in a former reign, they were declared illegal and void, and considered (in the light of which religion must view them) a mere pretense to sanction the crime of adultery." The end of the Napoleonic Wars was also a particularly busy time. The first recorded instance of an exchange of money for releasing a husband from the obligations of his marriage comes from Bilston (near Wolverhampton, Birmingham), in the 1690s, when "John son of Nathan Whitehouse of Tipton, sold his wife to Mr Bracegirdle." Not long afterwards a man was presented in the Thame church court for cohabitation with another's wife. During the proceedingss it came out that he had "bought another's wife" off her husband at 21/4 pence the pound." By the early eighteenth century, references to wife sales were finding their way into the press. The Annual Register carried the following account in August 1733. Samuel Whitehouse, of the parish of Willenhall, in the county of Stafford, sold his wife, Mary Whitehouse, in the open market, to Thomas Griffiths, of Birmingham. Value, one guinea. To take her with all her faults. 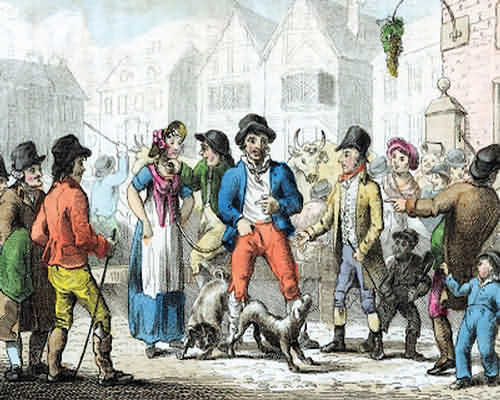 In 1820 a 'decent-looking man' led his erring wife into the cattle market of Canterbury and when the autioneer refused to auction her first he hired a cattle pen to keep her in until she was eventually auctioned for five shillings (25 pence in todays money). The Duke of Chandos and a companion dined at the Pelican, Newbury, on the way to London. A stir in the Inn yard led to their being told that a man was going to sell his wife, and they are leading her up with a halter around her neck. They went to see. The Duke was smitten with her beauty and patient acquiescence in a process which would (as then supposed) free her from a harsh and ill-conditioned husband. He bought her, and subsequently married her.